I’m a little embarrassed to share this…but…the first summer I wore contacts…I bought seven pairs of sunglasses. I went overboard. All different colors, sizes, and shapes. I was just so excited to be able to wear them again. I hadn’t worn sunglasses since I was a kid and was rocking the hot pink star or heart shaped plastic sunglasses. 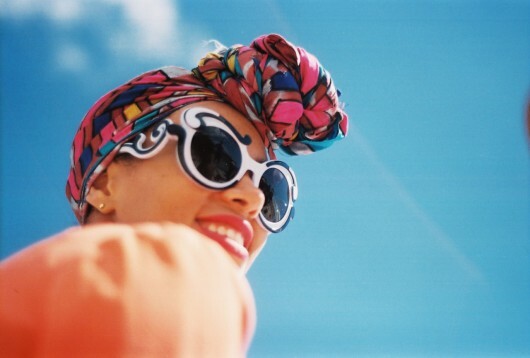 I think, especially since summer is officially upon us (WOO HOO), that you just can’t LIVE without a nice pair (or several nice pairs) of sunnies. Gotta have a pair of funky sunnies. Don’t be afraid to explore different shapes like our girl Solange modeling a pair of Prada sunnies or play with color like these shades from Tom Ford. I have a few of the larger than my pretty face sunglasses including a paper similar to Kim K’s that I snagged at H&M. Some people say they are “bug eyes” but I think they can add just the right amount of BAM to even the simplest look . 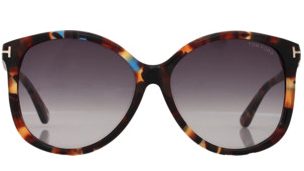 If you’re going to LIVE why not have a pair of larger than life (okay well your face) sunglasses? I don’t know about you but you can’t really go wrong rocking metallic anything when it comes to accessories. Personally I’m a fan of gold and maybe it’s because it compliments my skin tone. 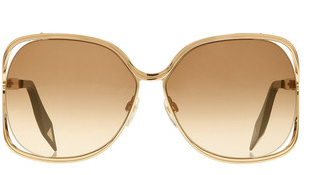 If you’re going to get a new pair of shades this summer don’t shy away from the glow of metallic sunnies. You didn’t think I’d recommend a list of sunglasses without recommending a pair of basic chic and sleek black sunnies right? These are a great pair of got to shades. Go to them for the errands or for the interview, the play date or the first date.